Artist Roni Horn has been traveling to Iceland from her home in New York since the 1970s. The unique nature of the Icelandic landscape and climate deeply informs all her work, which ranges from sculptures and drawings to photos and books. In the 1990s she discovered the local library in the small town of Stykkisholmur and was impressed with its architectural style and its views of the sea, sky, town and harbor. When the library ceased operations in 2003, Horn proposed the creation of a permanent installation in the building. The result, Vatnasafn/Library of Water, opened in 2007. The second exhibit, Weather Reports You, consists of taped interviews with 100 Icelanders about their interactions with the weather and selections from Horn’s books about Iceland. The third part of the library is a private writers’ studio where each year writers from Iceland and abroad are invited to live and work for several months at a time. The idea of a library of water gathered from glaciers is not only beautiful and novel, but may become essential. A great deal of information about historical climate, atmospheric and geological conditions is trapped in the ice of glaciers. As global warming causes the glaciers to melt, we may have no choice but to look at them in a preserved and cataloged form, like antiquated books in a library. Information about visiting the Library of Water is here. If you can’t make it to Iceland, you can see related work by Roni Horn at the Hauser & Wirth Gallery in New York City until January 11, 2014. 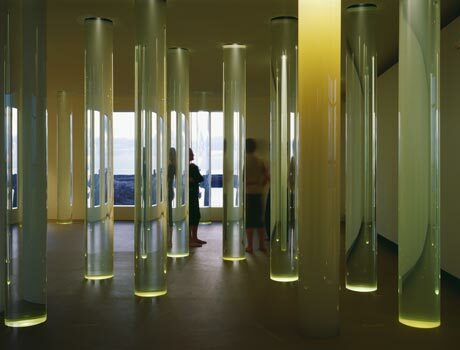 This entry was posted in The Art of Science and tagged Conceptual Art, Iceland, Library of Water, Roni Horn, science art, Water Art. Bookmark the permalink.